I am pleased to announce that we updated 9facts on this week. Speaking honestly, we released the first really usable version of 9facts. Nearly everything was changed, starting from the front page. Take a look at the presentation to get familiar with the new features (I recommend watching it in full screen mode). Here I'll describe the most interesting changes. All keywords mentioned in facts, as well as all their ancestors in the keyword taxonomy. For example, if "English language" keyword is mentioned in some fact, that fact will appear in fact rankings for "Languages" keyword. Various time frames - "all time," "yesterday", "current week", "current month", etc. If you have filled in the "Location" field in the account settings , all your facts will participate in the rankings for the specified city / country. Check out top facts for Yekaterinburg and Russia. Any fact is related to "All" keyword - and thus, appears in a single global fact rating. The most popular types of facts are shown first - more precisely, they are ordered by popularity. Popularity is proportional to the total number of the facts of this type in this top and the total number of users that liked them. The best results (for each fact type). Location-filtered tops shows what are the best achievements in these locations during the specified time frame. In particular, they allow you to discover who is the most popular in Twitter, who has the highest reputation on Stack Overflow, who ran the longest distance this week, did the best bench press in 1 rep, and so on. 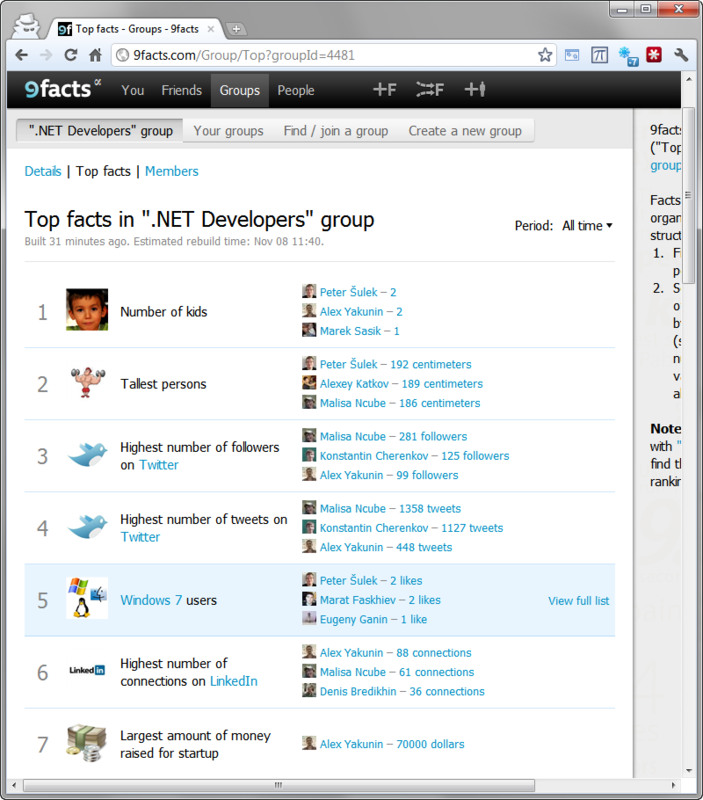 Group-based tops provide the same statistics for a group of users. 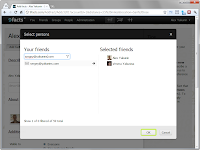 Such tops reflect common interests of group members, because they are based on facts and likes of group users only. And finally, every single user has a top with facts related to his friends. - By your location (we use information from your settings, and IP geolocation, if you aren't registered). For now all these tops are built for "All time" range, but this will be changed in future. Our main goal is to make the front page fully customizable by users, as well as to show all the news and important changes there. The right pane is a stream of recent facts added by users. It is fair to say that the previous implementation of "Add fact" couldn't be called as "working" at all, but nevertheless, we decided to release 9facts with this part at 09.09.2011. We were eager to launch 9facts at this date by two reasons: this date was announced in May in my Russian blog, and also we wanted to visit Startup Rocket event with Steve Blank, but that was impossible without having a working prototype. On the other hand, it was clear we will be launching an early preview, not even alpha. So we succeeded with the first and second. The fact that we are one of just 8 Russian startups that won the competition for being presented to Steve Blank was absolutely amazing. But it took two months after that moment to finish everything and make the service at least partially attractive for users. If you don't know, the version we "launched" at 09.09 was allowing to just enter some facts and browse them - nothing more. And, as I'm saying now, even this part wasn't really working. That's why we're announcing 9facts much more widely just now: we couldn't do this earlier, because we knew even early adopters would be disappointed. To enter the fact, press +F in header and type in any related keywords. Moreover, you can simply type in the text of the fact - the closer it will be to some known template, the more chances it gets to be recognized and transformed to a fact. You can enter anything as text, including keywords and measures (eg, "5 miles" or "$50"). 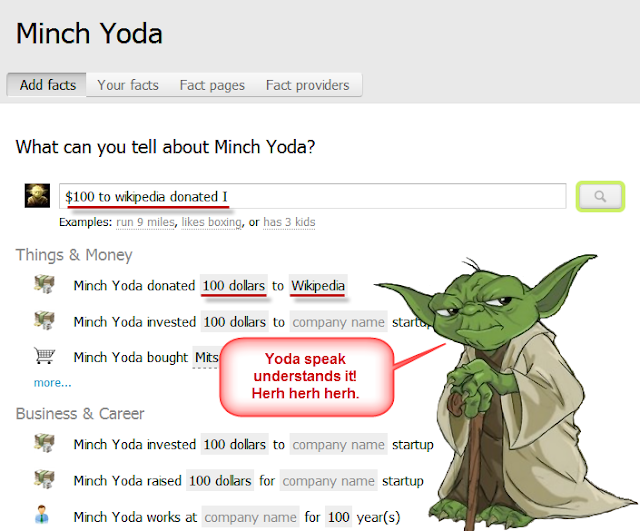 As the result of this step, you get a categorized list of pre-filled fact templates. You need to select one of them and fill it all the fields that 9facts was unable to parse or recognize (if any). In the worst case you can simply select an appropriate template from the list on the same page. There are ~ 150 fact templates. This is a pretty good number for casual facts, keeping in mind that each template can be parameterized to a huge set of different facts. We estimate we need to raise that number to ~ 300 to close the most common types of casual facts that people usually "measure", so we add about 10-20 new templates each day now. Currently the creation of new fact templates is solely our own responsibility, but in the long run this feature will be available for users as well. The same is almost correct about editing a keyword taxonomy. "Almost", because when you enter a fact with a new keyword (unknown to 9facts), we instantly see this keyword in a list of candidates for addition, and usually add it pretty quickly. 4. 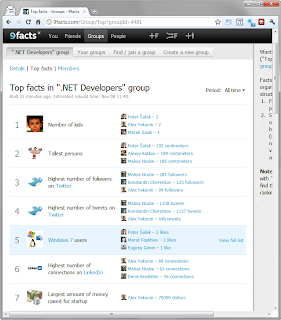 Groups, fact confirmations and "Like"
Groups of software developers - in cities, countries, or within companies. Currently such groups can reveal the most popular technologies used by developers, as well as compare the reputation and popularity of their members. In the nearest time it will be possible to compare the productivity (using RescueTime) and some other metrics related to it, including the number of commits, modified lines of code, etc. As a result, it will be possible to compile a set of real facts describing how you normally work - in particular, to stand out among others. 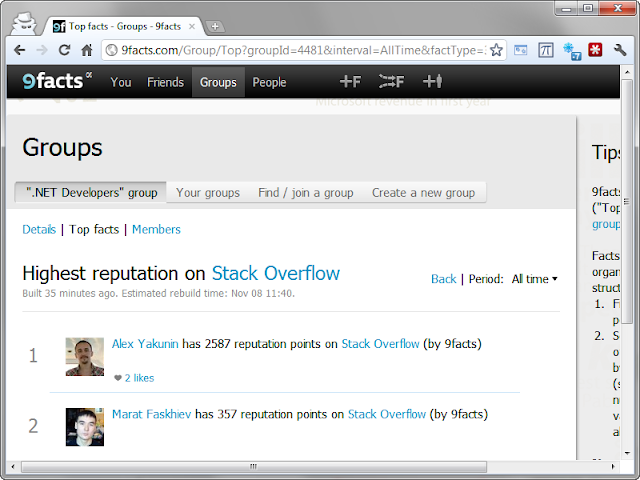 Stack Overflow / Stack Exchange user groups in cities and regions. It's always interesting to know who is the most "advanced" expert in some particular field, and the reputation on Stack Overflow is pretty interesting indicator of knowledge depth. And for users in such countries as Russian Federation, it also demonstrates an ability to read and write in English. Group of bodybuilders, cyclists, snowboarders, travellers, etc. - or simply people with active lifestyles. We are adding and will add more and more interesting fact templates for these people. Most of such templates can be found in "Sport and Health" and "Travel and Tourism" categories. Groups of people of having the same hobby - for example, aquarists. Groups uniting people from the same company, college, school, class, etc. - to know who and why is the interesting here. Any fact can be confirmed (except facts created by applications). However, a fact can be confirmed only by friends of a person it is about. Currently confirmations don't play any role (although you can see how many confirmations are there, and who has confirmed a particular fact), but in the near future their role will be quite significant - e.g. facts without a confirmation won't be included in tops. High credibility of provided information is one of our long-term goals. And finally, you can mark the facts you like. The number of "likes" affects the position of this type of fact in any top, as well as the position of this fact in ranking of facts of that type: if there is no fact metric, facts are sorted by the number of likes they got. You can vote for already proposed ideas / improvements you'd like to see on 9facts, as well as suggest your owns. This implies that you have to re-authorize on Facebook, if you are using its fact provider, or sign in to 9facts via Facebook. Remove your Facebook identity at 9facts. Add this Facebook identity again. By doing this, you will re-authorize on Facebook. Enabling fact providers does not lead to the publication of collected facts. This happens because all the facts supplied by fact providers have private visibility by default, ie, you just need to make them public. 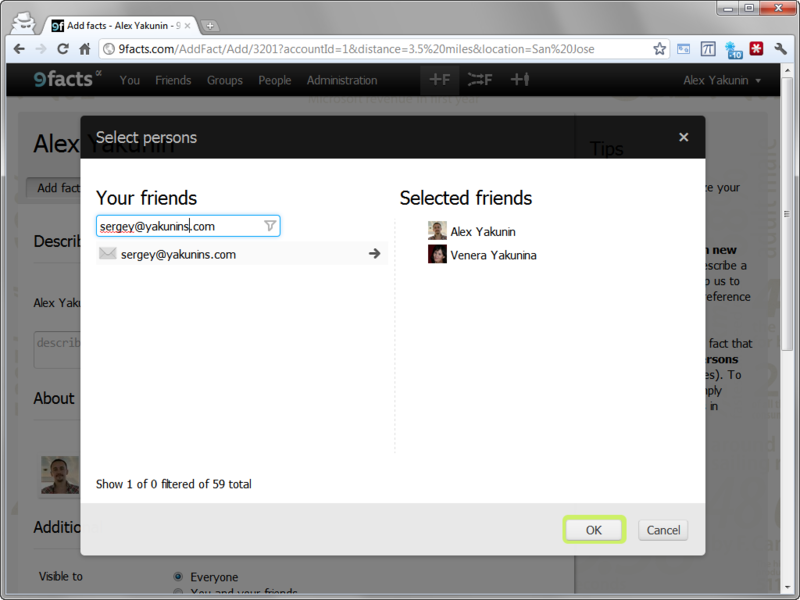 It will be possible to change visibility settings of such facts right in fact providers section in near future. In the meantime, I recommend you to turn off and on all fact providers, and change the visibility of old facts to "visible to all." The facts created for someone else (yes, this is possible - when you add a fact, you can select a group of people it is related to) don't appear instantly. The reason is the same here, and this is fully "by design": only the user the fact is related to can make a decision about its publication in his fact list. When you create a fact, you can't list keywords separated by commas. Unfortunately, currently this is true: you can't write "I like "The Matrix","Groundhog Day" and "You've Got Mail", but you can make 3 separate facts about each of these films. We'll fix this in future. Filling in the fields of fact templates should be done carefully. We are adding various tips, but it's still fairly easy to make a mistake by writing, for example, a company name and the beginning year of work there instead of just a company name. But the only consequence of this is that we won't add keyword "X-tensive.com, from 2007 to 2009" to a list of companies (it was just an example), and accordingly, the fact won't appear in fact rankings. So I advise you to expand the list of suggested keywords before typing something new, and enter a new keyword in style that is close to other suggestions there. Tops aren't updated instantly. Yes, currently tops are updated approximately every 4 hours. It's hard to say how this will work in future, but I can assure you this will happen at least once a day. You can't send messages to other users, as well as leave comments. This is what we are working on now. But there is a sort of of "hack" allowing to send a sort of "message": you can create a custom fact (it is at the bottom of the list) for that user with a message in fact text (or in the "Impression" field). Since all the facts created by other users are private, this fact will be seen just by the person it is addressed to. It is unclear what to do if you can't find a suitable fact template. The solution is to create a custom fact - we are looking through them and add templates, when facts seem fairly typical. Alternatively, you can leave a request @ UserVoice. The people working with PC on nearly full-time basis. We're bringing support for RescueTime, the whole set of Stack Exchange sites and simple statistics for leading VCS. Stack Overflow is already there. Bloggers and Twitter users. We are still thinking about what we must support first here, but the alternatives include Google Analytics, Blogger API, Feedburner and Google Reader API. Twitter and Facebook statistics is already there, but we plan to improve it. People with active lifestyles. We will support RunKeeper, as well as make all sorts of fact templates allowing to enter their successes and results directly. 9. What we would like to hear from you? Feedback! We would be extremely grateful if you tried to use 9facts, and wrote us what you like / dislike (the second is more important :) ). Specify your city or country in account settings - otherwise you facts won't appear in city / country tops. Enable as many of fact providers as you can, and / or try to add some facts about you manually. If you don't know what to add, look up the biggest top to get some ideas (remember, there is "Add fact like this" action in context menu of any fact). Invite friends or new group members. Btw, you can invite a friend and add a fact about him at once: just enter his/her e-mail in the search box when selecting a people the fact is related to (see the screenshot at the right). See the changes in tops after publication of your facts (remember, this will happen in 4 hours at max). In particular, in your city and country. We would highly appreciate if you share your impression with us. 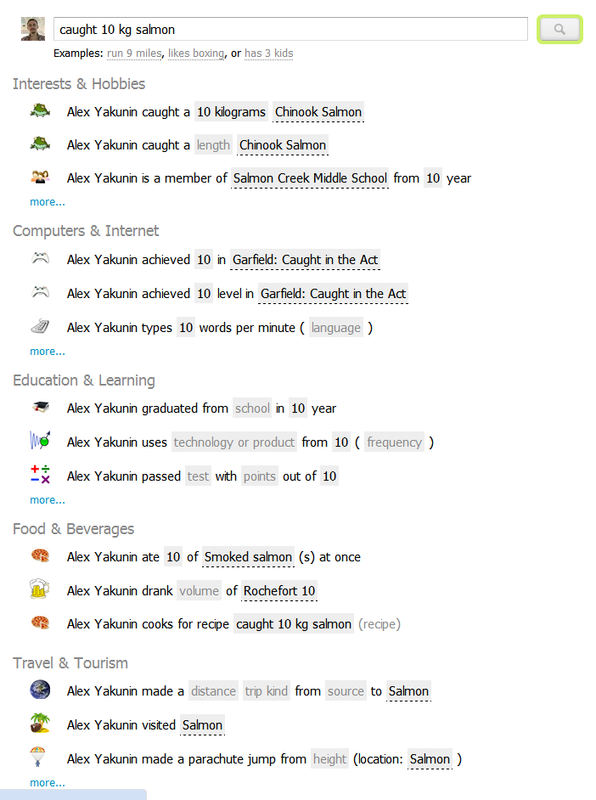 There are several ways of doing this: create a fact about Alex Yakunin on 9facts, send an email to info@9facts.com or leave a feature request @ UserVoice. P.S. I'm already very grateful to you - you've just read this large post to the end!